Published January 2, 2016 at 190 × 265 in Buddha as Elephant: Dhauligiri to Dindikal and the Mystery of Ganes. 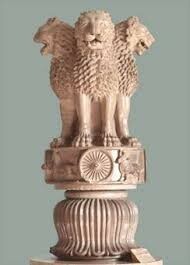 Lion capital of Asoka. The Mauryan emperor depicted Sakya Simha as roaring lion with four heads to represent the universal value of his ethical teaching the Dhamma.